SKU: DSG-12_Basic-Conversion-cost. Category: Slug Guns. Photo: DSG-12-870 EXPRESS Basic Conversion, fully rifled barrel. Shown with Optional Rem ShurShot Camo Stocks. The “DSG”-12 (Designated Slug Gun) designation refers to the fact that TarHunt fits a “non-removable” (except by a gunsmith) custom fit TarHunt/E.R. 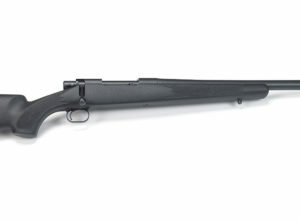 Shaw rifled slug barrel to a Remington 870 receiver. 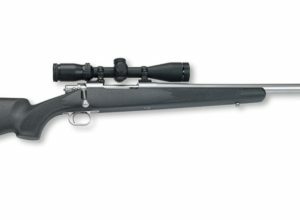 This rifled barrel is not field strip-able and has a, threaded in, one-to-one fit with the receiver for the best possible accuracy. The rifled barrel has a matte black metal finish and measure 23 inches in length, 1-28 twist rate and includes the standard muzzle brake as standard. WE CANNOT CONVERT ANY MODEL auto-loader or Express 20ga pump guns at this time. After the barrel in threaded into the receiver, TarHunt will drill and tap the receiver for a set of custom made TarHunt two-piece windage bases (using # 8 screws) made expressly by TarHunt for this DSG conversion. These custom bases will be installed on your DSG when it is returned to you and will accept any of the standard turn-in rings that are available from a number of manufacturers. Any privately owner firearm send to TarHunt for a conversion or repairs must be shipped with a copy of the OWNERS DRIVER LICENSE of your state OR firearm ownership card if one is required by the state you live in. When completed, the firearms must be returned directly to the address on the original accompany ID. Any change of ownership of this weapon must be transferred thru a current FFL holder. Specifications can change without prior notice. Scope bases are included, scope and scope rings are not. This conversion as shown is not available as parts, for purchase online, as it must be installed on your 870. 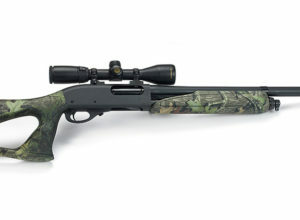 Or purchased as a new 870 Rem Express all ready converted. 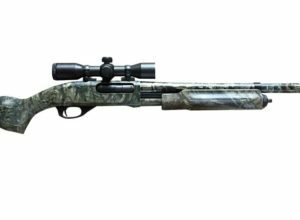 Please call 570-784-6368 to plan your DSG Remington 870 TarHunt Custom conversion. Ownership of a new weapon must be transferred thru a current FFL holder. Call for delivery times. Barrel twist rates, chamber lengths & overall lengths of the barrel are subject to change without notice. NOTICE: Prices are subject to change without notice. As much as a $70.00 (NON-REFUNDABLE) charge will be assessed against your original deposit for any cancellations on the owners behalf; to offset return shipping costs..